A different take on the Greek myths. 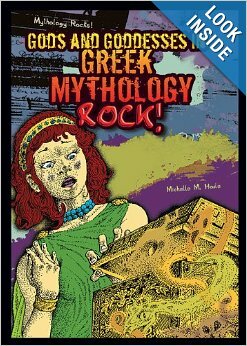 This book supplements Greek myths with history, archaeology, and psychology for an interesting explanation of many common stories. The well-known story of Prometheus bringing fire to humans is told with more detail. The fire incident was not his only intervention between the gods and humans, thus making Zeus’s punishment a little more understandable. Each chapter has a section of “Expert Commentary.” In the chapter on Prometheus, the experts emphasize how much Prometheus has inspired people as humankind’s best and earliest benefactor. The preface includes useful information about Greek culture and religion. By showing how the myths played a part in a Greek’s everyday life, their approach to festivals and worship is clarified for modern-day readers. Other stories include a creation story, the Titans, Pandora, Demeter and Persephone, Dionysus and his followers, Baucis and Philemon, Echo and Narcissus, and Helius and Phaethon. Special features include a chart of the gods and goddesses, a map of the ancient Greek world, a question and answer section for each story, a glossary, chapter notes, further reading, internet sites and an index. For students who can’t get enough mythology, this gives them more than simply a collection of stories. The illustrations give it a graphic novel look. Yet, it has a rather scholarly tone, so the recommended level of 6th grade and higher is accurate. The publisher’s website provides a reading level of 7.8 so it could even appeal to high school students taking world history. The question and answer section could provide a literacy activity but, since the answers are given, the questions would need to be used in a discussion or retyped into a reading worksheet. With all the history that is included, a book trailer or PowerPoint would be a fun way to approach reports. TITLE: Gods and Goddesses in Greek Mythology Rock!